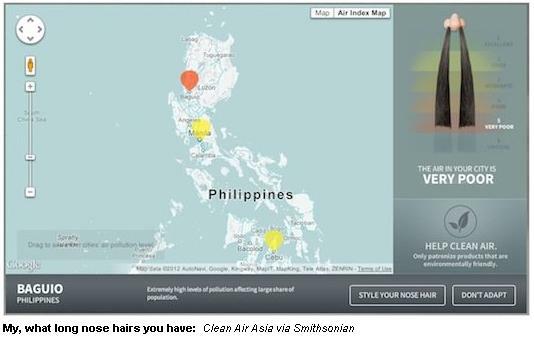 Clean Air Asia creates a strange visualization of air pollution in Asian cities represented by the length of nostril hair. The colored balloons on this map of Asia represent current levels of air pollution, namely particulate pollution, which are at harmful levels for nearly 70% of developing Asian cities, according to Clean Air Asia. But the brightly colored dots on the map probably weren’t what caught your eye — maybe it was the giant pigtails sprouting from the lone nose on the right? The nostril hair visualization is part of a strange campaign to raise awareness about the severity of air pollution in Asian cities. 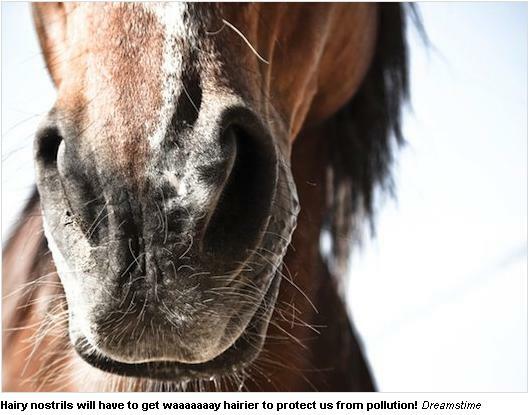 It is aptly titled the Hairy Nose campaign (Clean Air Asia probably figured that mildly offensive nostril hair was more compelling than a list of polluted cities?). Turns out that nose hairs aren’t completely random–in fact they’re pretty important in straining out the harmful things we breathe in. Last year Popular Science reported that “nose hairs trap dirt, viruses, bacteria and toxins until we blow them out, sneeze, or swallow,” so maybe it’s not that strange after all to think about air pollution in terms of how much nostril hair we might eventually need to breathe safely. It’s still not entirely clear exactly how much particle pollution corresponds to the length of hair, the map only tells you where your city falls on the spectrum of “excellent” to “critical” air quality (and only for Asian cities right now). Still, it’s an effective way to bring attention to a growing problem–Clean Air Asia says that “800,000 out a total 1.3 million people dying prematurely each year from air pollution are from Asia”–and if weirdly styled nose hair helps raise awareness, I’m all for it.